From what I understand, the "touch screen" on the CTM Midi allows you to select the size of hose attached so that the airflow detection required for M Class works correctly. Looking at the picture I don't see a button to select the suction, only a selector for hose diameter. The large +/- buttons are for selecting suction, that's for sure. Hose size is selected, maybe only with the RFID chip in the new hoses? Thus changing to an old hose with other diameter doesn't work? Is that speculation from your part or hands-on experience? At this moment it's speculation, but within 3-4 weeks I can confirm this because I ordered the new CTL Midi model. Look at the picture below: all horizontal green bars are lid, so maximum suction and done with the +/- buttons. What else are these buttons for? Having seen how covered in paint, plaster, glue etc some people's CTs get... I hope this touch button screen can hold up to years of being scrubbed clean.. I think I see the membrane plastic starting to crack and split before it made it thru the photo shoot . Modern production and inventory systems use RFID tags, so FS may just use a choice they already made to build upon for new features. yes, they are everywhere, not that it's a great thing, but if it means you have to have the latest hoses for it to work it's a problem. What if you have old hoses, or hoses from a different manufacture, etc. You don't want to end up like Kerig putting RFDI tags in coffee pods to lock out 3rd parties. Or what if the tag isn't molded into the hose but is stuck on it someplace. Then folks do the normal thing and remove them like you do anytime you have a tool apart, now suddenly it doesn't work. Just wait for the North American version, instead of 50, 36, 27, 21 we get 1-24/25 1-2/5 , 1-1/16 etc. I'm still looking for a tape measure that will read out 7-2/3" so I can set the rear stop on my MFT/3 per Festool's manual. I just don't get this design verses a knob. Also when you press the "Man" button, does he show up right away, or how does this work, and can there be a Woman button? I know the big CTs say "man" too, but I don't think they were space constrained here. More than one person is going to get busted on from their buddies for pressing "the man button". LOL...and if you find one of those tape measures, let me know because I need one to set my HKC that reads out in inches but only indexes in millimeters. Before starting, press the +/- buttons to adjust the hose diameter. Startup with +/- buttons sets the power. Festool have just posted an image on Twitter and confirmed (I assume) that the TKS 80 will be "live" at the BAU Fair in January! Translated from the tweet - "The first drawing of the #SawStop technology in a new #Festool machine. At the fair BAU from the 14th to the 19th. January you can experience it live." @GarryMartin , Thanks for posting that. That is cool! TSK 80 is maybe modular. There will be a short base for table top mounting and a tall base for floor level. Perhaps a rigidity enhanced MFT option also. Interesting that they decided to keep it totally quiet until a few weeks until unveiling. 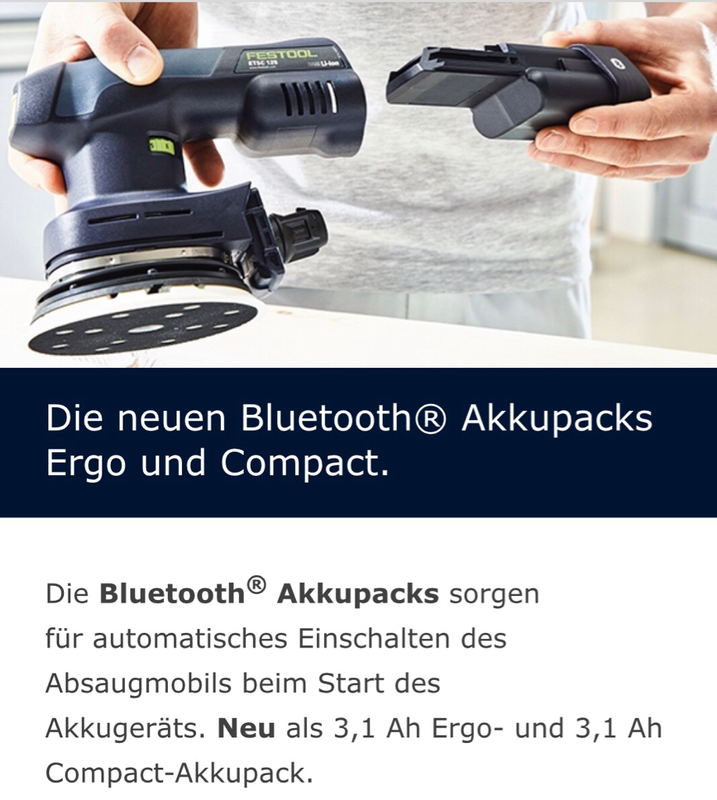 I don’t know if this information has surfaced here already, but the new compact Bluetooth batteries have also been officially announced. For both, Sanders and Drills etc. “Wandmontage ermöglicht“ - possible to be mounted to the wall. If SawStop tech was incorporated it is more likely to be approved by UL. On the other hand, the arrow is pointing at a green strip (looks similar to plastic glide strips on guide rails) a considerable distance from the blade. Jokes aside, I think it'll be a clearly visible indicator that the system is active, like lighting up that strip. Looking forward to the table saw, especially as (given the name) it'll have 10mm more cut capacity than the CMS with TS-75. I just fear the pricing will be prohibitive. Am I the only person who has "a-ha - take on me" get stuck in ones head looking at this image? Well I wasn't but I am now that really takes me back. I wonder how many younger people would have no idea what your talking about. Any news on the impact drill - ill be at Bau in January so will post a few pictures of the saw & hopefully impact drill !? As I predicted (though it was not that hard) the TKS 80 is not a pull saw but a "regular" fixed blade table saw. If it shares components with the existing CS 70 it will be very interesting. I can't see why not? It seems like I can order the feet for the SYM70 to my old existing one. It will bring it up to SYS 1 level. That is great, thanks Festool! That seems to be the only difference between the new and the old though. In the physical catalogue the feet are listed as an accessory for the previous model. On the other hand that Impact I've been pining for - for years - seems to be a somewhat elusive unicorn at the moment. I'm really curious if they will make a variation that fits in the CMS and offer it in N.A. since they don't offer the TS modules in N.A. Extra class down to the last detail. Fitting of cornice profiles up to 168 mm in "original wall position"
Just curious . . . Do the specs show improvements over the previous model? Like motor? Any others? I don't know the specs from the previous generation and, given FOG feedback, there seems to be at least some question about durability of the motor. I know at least 2 people who have never had a problem that they didn't cause, but . . . just wondering if Festool has made improvements that others believe are significant. Don't know for sure, the limited electrical specs that they list are the same as for the original Kapex. It just appears to be cosmetic changes.